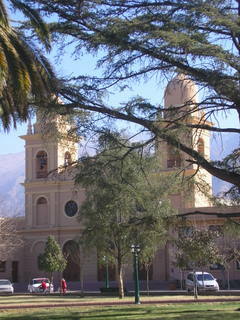 Cafayate sits among vineyards in Argentina's Andean northwest. Argentina's vineyards have the advantage of high elevation in the leeward Andes, where the sun shines 300 days a year, and a soil balance of volcanic ash and ancient sea bed minerals to grow some of the finest wine grapes on Earth. The premiere grape in this nothern wine region is the torrontes originally brought over by the Basques from Galicia in northeastern Spain. It produces a delicate, flowery white wine that has a nice balance between acidity and fruitiness. 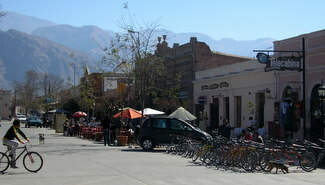 On Plaza San Martin are a number of restaurants with predictable menus, but it is pleasant to sit out on the sidewalk, even on a sunny winter day in the upper 60’s. Restaurant Carreta de Don Olegario was perfectly acceptable. 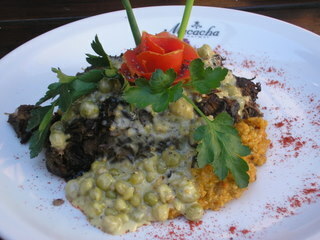 On the other hand, several blocks from the Plaza, Restaurant Macacha was a culinary gem! The land naturally provides abundant produce, fish, seafood, fowl and meats in delectable conditions and flavors that no human could ever design in a lab - that’s a given. What seems misunderstood is how humans can take these delicacies and turn them into bland, unappetizing or just plain bad preperations that are served both at home and in most restaurants. 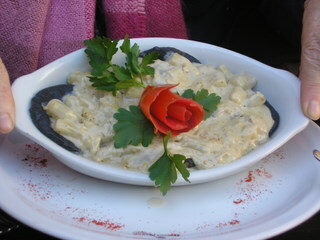 The difference between food and cuisine is not fancy sauces or presentations - although that can be good and fun - but proper execution in the kitchen (cooking technique and seasoning). There is nothing more succulent than an Argentine lamb seasoned with salt, pepper, oil and garlic properly roasted over fresh wood charcoal. There is nothing worse than a tender free range chicken breast pounded to death, heavily coated with salty bread crumbs and deep fried in old oil. 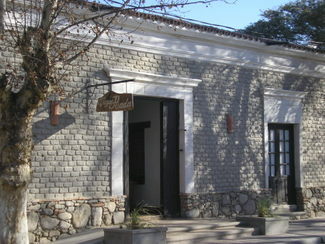 Argentina’s magnificent abundance of organically farmed and raised food products reach their true greatness in the hands of talented chefs who have the training to use what’s local in imaginative combinations and presentations. 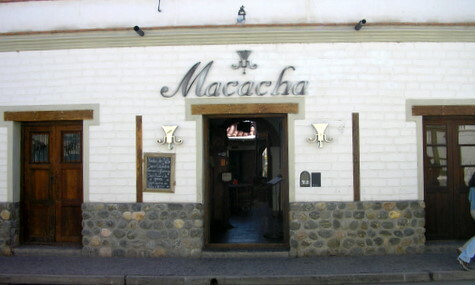 Based on that standard, Restaurant Macacha ranks in my top ten restaurants in the nation and a reason in itself for any foodie to make Cafayate a destination. 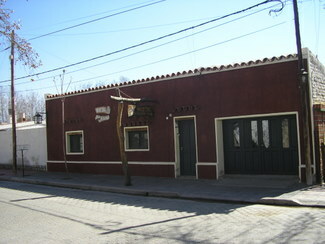 Its building on the outside is a simple Spanish colonial one-storey town house. 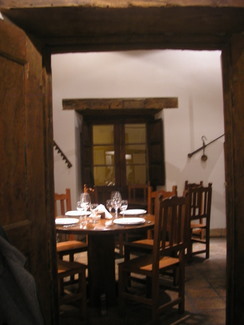 Inside is a museum-quality 18th century interior with all its original features down to the doors. 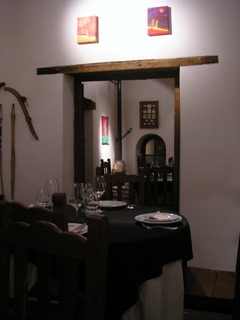 Simply decorated with a few old tools, antiques and art, the tables are covered in black cloth, a perfect foil to the building’s simplicity and food presentations. 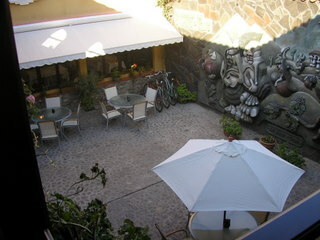 Naturally, there is a courtyard with tables where we had lunch the following day. Dishes included sautéed congrejo (large eel) in a buttery white wine sauce with roasted peppers, a fricassee of lamb in a richly flavored white stock with slivers of fresh vegetables, and a unique vegetarian plate of creamy peas, wild mushrooms and maze topped with a perfect tomato rose. The kitchen facilities were adequate but hardly state-of-the-art which, obviously, did not dent excellence. The chefs, as I was not surprised to discover, were a couple of young culinary college graduates in their 20’s. 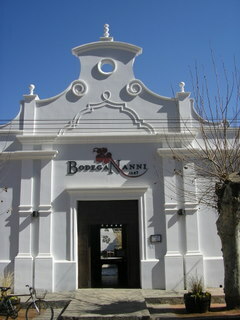 My travels have made it clear to me that Argentine culinary training is producing top chefs. 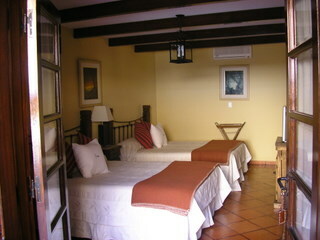 Set in a restored 19th century mansion, Hotel Villa Vicuna has everything a guest could want, including wi-fi. The rooms are beautiful, individually decorated and open onto the two courtyards which have tables, schulpture, antiques and gardens. 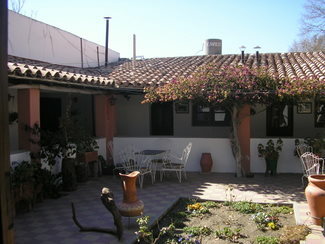 The second floor rooms open onto a wide veranda overlooking the courtyards with its own seating. Service is attentive. 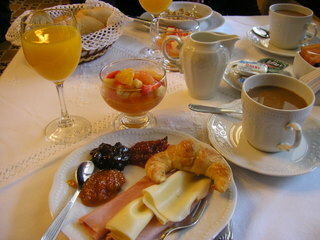 Breakfast is served in a glass walled room looking out onto the main courtyard and drinks are available at its bar in the evening. 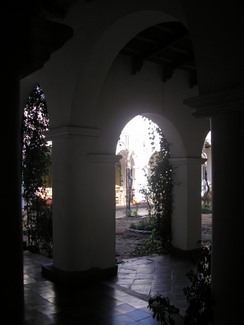 The hotel is only two blocks from the Plaza yet the thick walls of the mansion insulate any and all possible sounds of the town. 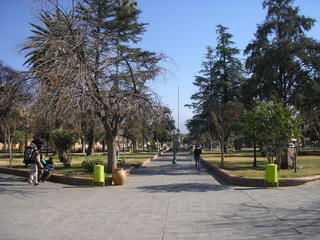 Double room with breakfast AR$300 (US$79.00). 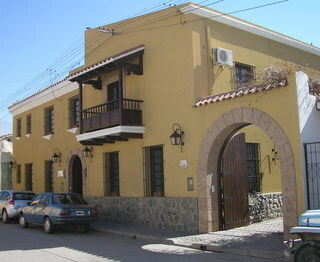 As in many small towns in Argentina, accommodations may appear modest from the outside, but once through the plain protective walls, many of these Posadas, hostels and boutique hotels open onto beautiful and tranquil interior worlds. 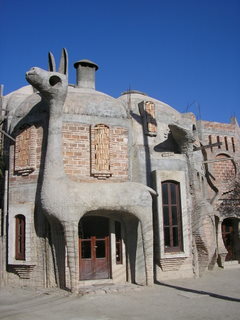 I never was able to find the purpose of this building?